So you don’t want to share your plans with the whole world. Or risk *him* seeing your dress. Or *her* seeing your gift ideas. No problem. Pinterest allows secret boards. Cool! Step 1: Scroll to the bottom of your profile and click “Create a secret board”. Note: I believe you can now specify that a board be secret when you create it in any other way also. Step 2: Give the board a title (and a description, if you need it). Step 3: Make sure you don’t change the “Keep it secret” thing to ‘No.” Now, click the create button! Now when you pin or repin, this board will be available to you. Optional Step 4: Invite others (if they’re on Pinterest) to your secret board, if you want to share or discuss you ideas (or want someone else to be able to contribute). 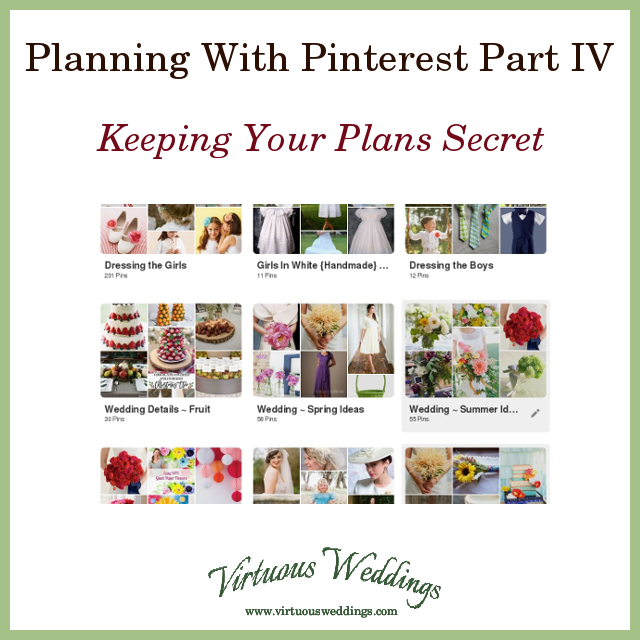 Why Use Secret Boards on Pinterest? Because there are things you don’t want certain people to see. Because you don’t want your friends and family to “see” your wedding ahead of time. Because you’re a private person. 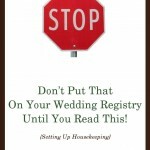 Because you just don’t want to share your wedding, home, etc. with the whole world (or at least, the whole Pinterest world). Now that you know this, there’s nothing to stop you from falling in love with Pinterest (and no, this post is not sponsored by Pinterest! ).